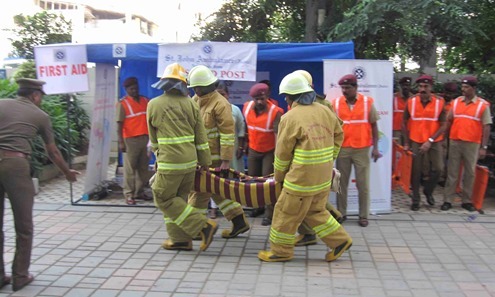 The most interesting and lively part of 3rd International Search and Rescue Conference (ISAR 2013) was witnessed by the delegates on 05 October 2013. 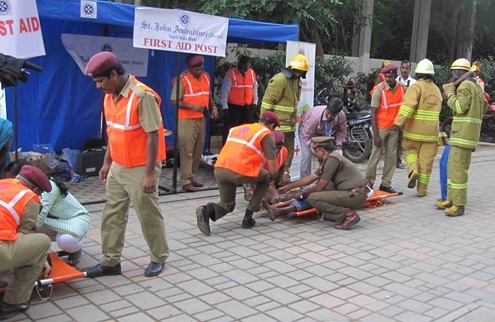 SAR Demonstration by Tamil Nadu Fire & Rescue Services Department and St John’s Ambulance Brigade, Tamil Nadu at Hilton Hotel, Chennai. A visit to Air Traffic Control and Rescue Coordination Centre, AAI, Chennai Airport was also arranged for the delegates of ISAR 2013 Conference. 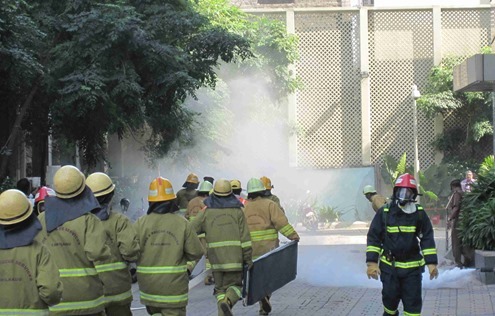 Fire and Smoke was detected. 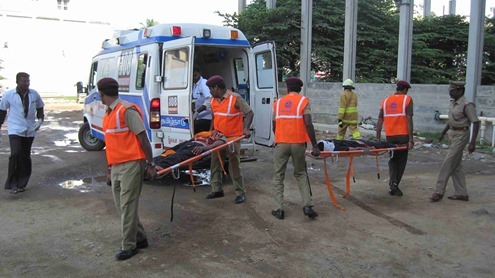 Team from Tamil Nadu Fire & Rescue Services Department arrives at the accident spot. The injured are brought to the First Aid post of St John’s Ambulance Brigade. 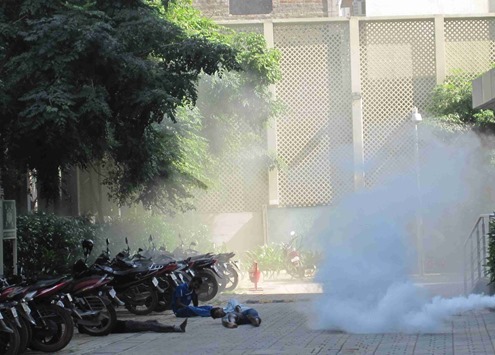 After First Aid, the injured are taken to Tamil Nadu Government Ambulance for further treatment in hospital. Commodore (Retd) S Shekhar, Convenor – Maritime Strategies Panel, FICCI, TNSC; Regional Director, NMF, Chennai Chapter gives a helping hand to the rescue team. Dog Squad of Tamil Nadu Fire & Rescue Services Department arrive to search for injured personnel in the inaccessible areas. 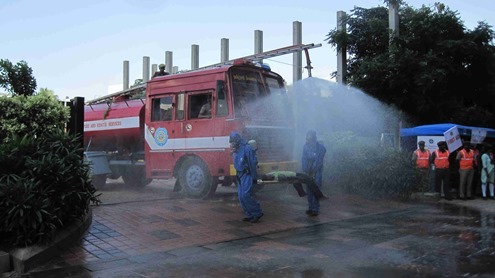 Decontamination Unit of Tamil Nadu Fire & Rescue Services Department decontaminates the injured in chemical accident. 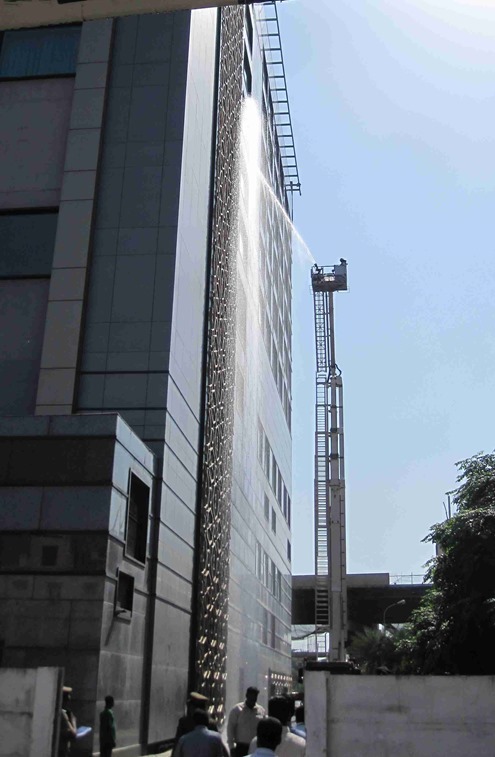 Rescue with the help of Bronto Sky Lift on the top floor of Hotel Hilton. The rescued person from the top floor of Hotel Hilton, being taken out of Bronto Sky Lift for further treatment. Dr T S Sridhar IAS, Additional Chief Secretary/Commissioner, Revenue Administration, Disaster Management and Mitigation, Government of Tamil Nadu is also present. 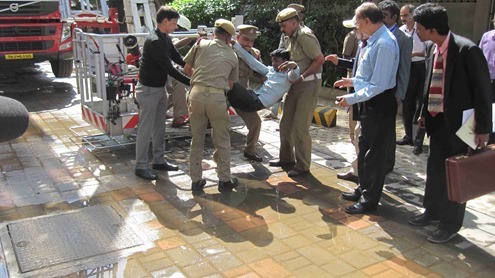 Tamil Nadu Fire & Rescue Services Department is being congratulated for their excellent demonstration by Dr T S Sridhar IAS, Additional Chief Secretary/Commissioner, Revenue Administration, Disaster Management and Mitigation, Government of Tamil Nadu. 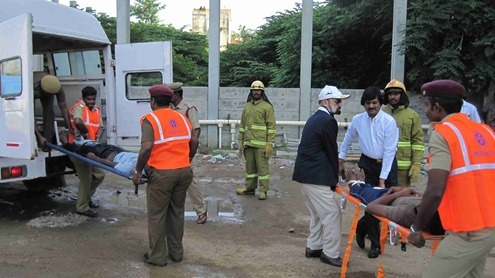 Commodore (Retd) S Shekhar, Convenor – Maritime Strategies Panel, FICCI, TNSC; Regional Director, NMF thanked Tamil Nadu Fire & Rescue Services Department and the St John’s Ambulance Brigade. Visit to Air Traffic Control and Rescue Coordination Centre, AAI, Chennai Airport. Thereafter the delegates of ISAR 2013 proceeded to Air Traffic Control and Rescue Coordination Centre, AAI, Chennai Airport for the visit. All the delegates visited the ATC for more than two hours. After the visit, Shri K V Murali, General Manager (ATM) of Chennai further briefed the delegates in conference room. Commodore (Retd) S Shekhar, Convenor – Maritime Strategies Panel, FICCI, TNSC; Regional Director, NMF, Chennai Chapter concluded the ISAR 2013 Conference by thanking Shri K V Murali, General Manager (ATM), Dr T S Sridhar IAS, Additional Chief Secretary/Commissioner, Revenue Administration, Disaster Management and Mitigation, Government of Tamil Nadu and all the delegates for their active participation. Here is Mr S Saravanan, Deputy Director, FICCI who has contributed his best to make this 3 day ISAR 2013 Conference a great success. 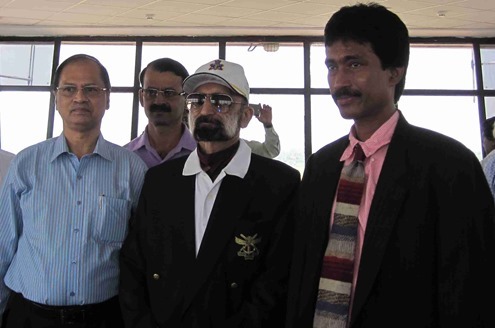 Seen extreme right along with Commodore (Retd) S Shekhar and Dr T S Sridhar IAS. Nice photos, nice article. Thanks. Silva, Cristiano – IT Consultant.